I've been sick with a nasty cold the last few days and am finally recovering (I hope). However, it leaves me a bit lazy and longing for some comfort food. As such, I threw together a menu that fits both requirements. 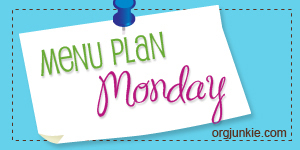 I'm linking this menu up with Meal Plan Monday at I'm an Organizing Junkie. Peanutty Thai noodles with sugar snap peas: We liked these a lot. The hubs said he wished the peanut butter had been a little sweeter, but I was using Jif, so I don't know how much sweeter I could have made it. I really like that the peas were still really crispy. I may make this again, but I may fiddle with the recipe to get a sweeter taste from it. Mushroom, corn, and poblano tacos: These were pretty good. They still needed a little 'umph' of something that I just couldn't figure out. I like that they were low calorie and still filling. However, I'm not positive I'll make them again. Red lentil rice cakes: Let me first say that the flavor of these was really good. I didn't make the salsa as the hubs doesn't like raw tomatoes. I had an issue with keeping the patties together. It was a real fight. The recipe is supposed to make something like 12 patties. I made 10 and still had mix left over for 10 more. I froze the second half for another time. As such, I guess we will be eating them again, but I'm not sure I'll make them from scratch another time. Delicious ham and potato soup: - I've made this soup many, many times. I'm a huge fan of potato soup and have tried several recipes, but this one is our favorite. I do tend to 'mash' the potatoes some once they're soft as I like it a little creamier than the diced chunks. I will most definitely make these again. Steamed shrimp & mushroom dumplings: As predicted in the instructions, these aren't a quick, throw-it-together dish. And though I was sick, I was willing to stand, stuff, seal, and steam to get these made. They were totally tasty and I will likely make them again when I'm sure I have plenty of time for them. Garlic sesame snow peas: I reviewed these previously here. It's time to turn my attention back to playing with the beads on my desk and enjoying the comfort that is lower temperatures! I can't really show you a picture of the lower temperatures. . .
Glad you are feeling some what better Hope. I am also glad that Karen fizzled out before making land fall yay! Yummy food choices and from the sounds of those dishes, well just let me say I am glad I ate before reading this post, or I would be in the kitchen looking for something to eat. 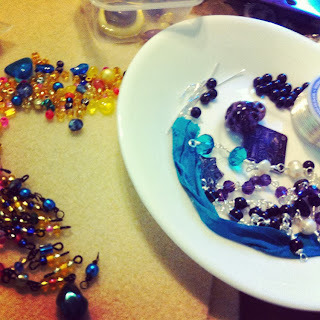 I like the looks of what you are playing around with on your bead table. Hope you're feeling better, I'm off to go play with beads too!